Frustrations with communication from the theater department and suggestions to move the performance off-campus preceded playwright Michael Weller’s ’65 decision to cancel the Brandeis debut of “Buyer Beware,” according to Weller and the play’s director Sam Weisman ’73. Weller wrote Buyer Beware after he was offered the Brandeis Creative Arts Award. Despite cancellation of the Brandeis production, Weller will still accept the award in the spring. “The Award is from the university not the theatre department, so I was persuaded to see the actions of the department as not reflecting the principles or philosophy of the university as a whole, which wanted to award my life’s work,” he told The Brandeis Hoot. “Buyer Beware” is inspired by the material of comedian Lenny Bruce. Weller spent time in the archives at Brandeis before writing. Weller told The Hoot that he has had little to no contact with members of the department since Bob Walsh, Associate Professor of the Practice of Theater Arts, suggested edits to the first draft of Weller’s script in June. Brandeis’ most recent statement from Nov. 6 is the first to acknowledge it was Weller’s decision to perform the play elsewhere. Instead of performing “Buyer Beware” in the spring, the theater department will create a team-taught course to discuss controversial art, including Lenny Bruce’s legacy. The department explored obtaining copyright to use the “Buyer Beware” script in the course, but Weller told The Hoot he will not grant them permission. After being named the Creative Arts Award recipient, Weller came to campus on five separate occasions to interview students before writing the play. The content was pulled from approximately 30 official and 45 to 50 casual conversations he had with members of the Brandeis community, according to Weller. He also spent time reviewing in the Lenny Bruce archives in the library. Weller delivered a draft to theater department faculty on June 3. At that time, the play was set to be performed in November, as part of the fall roster. Walsh emailed Weller shortly after reading the play expressing excitement about the play and calling it a “very compelling journey for the students.” Walsh also told Weller that the play needed to “go a notch deeper” on the “faculty/admin storyline.” Weisman read the email aloud in an interview with The Hoot then sent a copy of this email to a Hoot reporter. A few days later, Weller made changes to add “depth and nuance” to several faculty and administrator characters. Weller gave a new version of the script to the theater department and since has had little communication with faculty. Set design for “Buyer Beware” began over the summer, according to Weisman, who met with Cameron Anderson (THA), the faculty member in charge of set design. Designs had been completed and were awaiting construction, according to Weisman. A copy of the draft made its way to other students in the theater department and Brandeis community. The Hoot obtained a copy in September. On Tuesday, Aug. 22, Weisman received a message from Susan Dibble, Interim chair of the Theater Department explaining that there were a lot of “problems” with the play. According to Weisman, she did not respond when he called back. Dibble did not respond to inquires from The Hoot by press time. In early September, Weisman says he contacted Adrianne Krstansky, Director of Theater Arts, and Walsh about auditioning students on campus for the play. Walsh and Krstansky warned Weisman not to come to campus, Weisman said. They decided to cancel student auditions and he was told that the play was going to move forward with professional actors. Weisman said it was not clear to him why he should not come. Krystansky declined to comment, referring The Hoot to the Nov. 6 press release concerning “Buyer Beware.” Walsh could not be reached for comment as of press time. Weisman met with Dean of Arts and Sciences Susan Birren to discuss fundraising for the play. Weisman contends that Birren was in support of the play, but Birren declined to comment when approached by a Hoot reporter and directed questions to the Office of Communications. Around this same time, Weisman says Walsh suggested to him that the performance be moved off-campus to the Watertown blackbox theater. According to Weisman, the suggestion to move the play off-campus with no set, minimal lighting, ten days of rehearsal and two equity actors for an eleven character play, would be limiting. Weller decided to withdraw the play because “the atmosphere that was developing around this play, made me feel that it wouldn’t be a joyous and happy atmosphere to rehearse in,” he told The Hoot. Weller now intends to stage the play at a professional off-campus location with no association to the university. In multiple Facebook posts and emails to the theater department and administration, students and at least one alumni voiced opposition to “Buyer Beware” for its use of the n-word and the way it portrayed black characters and the Black Lives Matter movement. “There are black characters who are written clearly by an older white person who doesn’t really understand the nuances of the Black Lives Matter movement,” Child, who read a draft of the play, said in an interview with WBUR. Child organized a forum for Weller to talk with multiple students during one visit to campus in Fall 2016. Students said the non-white characters in the play were portrayed as stereotypes and lacked depth. Child was named the 2017-18 recipient of the Sam Weisman scholarship before the beginning of the academic year. His name has been withdrawn from the award, according to both Weisman and Child. The university would not disclose and information about the scholarship fund to students, according to an email from Julie Jette, Director of Media Relations. Weisman was not aware of the the decision to fully cancel the play until he received a copy of the Brandeis Arts magazine in the mail. Walsh had interviewed Weisman and Weller for a piece in the magazine, in anticipation of “Buyer Beware’s” debut on campus. The piece did not make it into the final copy of the magazine. In 2016, Weisman directed “Freedom of Speech: Lessons from Lenny Bruce” with a cast of six undergraduate Brandeis actors and an undergraduate stage manager. They performed five times in the Greater Boston area and once in Schwartz Auditorium on the Brandeis campus. The play incorporated comedy routines from Lenny Bruce which used the n-word and other racist and sexist slurs. Each performance was followed by a discussion with audience members about free speech and the contents of the play. 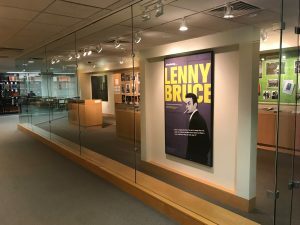 The student actors helped create the play, discussing their personal experiences with discrimination and listening to items from the Lenny Bruce archives, which Brandeis acquired in 2014. Playwright and dramaturg Amanda Faye Martin used the students’ discussions from multiple meetings, facilitated by Weisman to write “Freedom of Speech: Lessons from Lenny Bruce.” Students were able to give feedback and revise content after Martin distributed the first draft of the script. Yair Koas ’19 participated in the 2016 production and read the “Buyer Beware” script. “I don’t see the two as being connected,” he told The Hoot. He preferred Martin’s writing and argued that the student-led process was a “more appropriate” way to handle the play’s thought-provoking subject matter. “The difference is that the group of Brandeis students who devised this script and put it on were a diverse group. We brought our own experiences to the table,” said Koas. Laura Marasa ’20, who also participated, said she might have been interested in auditioning for “Buyer Beware” had it been performed. Another participant, Jacob Kleinberg ’18, said that he came to the understanding that people should “have the right to be offensive and disrespectful and wrong” though they may face social retaliation if they do so. “Words themselves shouldn’t be off-limits,” Kleinberg said. Three student cast members reported a positive experience working with Weisman as a director. None of them expressed concern at the use of derogatory and inflammatory terms in the show. Two student actors could not be reached for comment. Both Weisman and Weller are alumni of Brandeis University. Weisman has taught classes at Brandeis.